No Fashion Today, Just An Opportunity for Fellow Bloggers and Content Creators to Open up a Dialogue about Review Blogging and The Responsibilities That Come With It. I am not a review blogger, I have said it before, and I think I need to reiterate that before I start this discussion. I do not solicit review copies, although I do graciously accept them, because with my tight schedule, I know I am bound to miss a lot of wonderful items out there on the GRID. I do not guarantee I will even have the time to look at what I receive, and as someone who does a "Look Of The Day" blog, for the most part, I only really have time to do one outfit a day. I do not just throw on folders of clothes and snap away, I take time to put an outfit together, choosing the hair, skin, eyes, lashes, accessories, and I do it with great care. So while I receive many wonderful things, I can only put one look per day on my blog, and that is no slight to anyones review copies, it is just that I cannot manage more then that and keep up with a post per day goal for myself. Is the responsibility of independent bloggers to investigate review copies of items that they have received to ensure that they are not contributing to, or supporting, content theft? I am sure that we can all agree that content theft is absolutely irreproachable. It is unacceptable, and it hurts us all. Similarly, I think we would all agree that proven questionable content should garner no support on the feeds, and even if we have cherished and supported that fraudulent content unknowingly, we should refrain from showcasing it further. But is it the responsibility of the Blogger or the Content Creator to get the word out when a DMCA is about to be filed? I cannot possibly be aware of all the DMCA actions going on in-world, and I am certain there are hundreds if not thousands of cases under review. But how can we know what is safe to blog, and what is not. Is there some data-base I am un-aware of where pending disputes are listed so I can stay away from those items until resolutions are found? As bloggers, must we go back and delete all the posts that have included the objectionable items, do we edit our blogs? Do we post a statement to let others know our stance on the situation? Do we act before a resolution is reached, and what happens if we all act after hearing only one side of the story, or do we wait for statements from both parties involved in the DMCA. Why do some content creators opt not to file DMCA Cases if they are certain they are being victimized? Is it ignorance of the process? The Hassle of the Forms? And if you don't file a DMCA, is it still OK to make statements against another party in a public forum? Why do some content creators choose to go public with these issues, while others don't ever bring their cases to light? I am really interested to hear from content creators who have or have not chosen to go public. PLEASE COMMENT! You can respond anonymously of course, and all comments will be published. Is there a way we as a community can come to some agreement about how we should deal with this issue that can prevent hurt feelings and regrets? TY Sasy, yours too. And to clarify, I in no way meant to slight review bloggers, I envy you and Ana Lutetia for the time and dedication you have continually put into your blogs, you do a wonderful job! I am just a sad perfectionist and it takes me so long to put one look together, take pictures and edit (since I am a Nurse, and am still learning PS Elements *lol*) that I could never do review blogging justice. I wish I could do it, but I just don't have the time. I don't think it's reasonable to demand that bloggers investigate every item. Maybe a quick google at most? But if something isn't known to be stolen content, I don't see that there's much you can do. If I give you a shirt would you have to check with every creator on the Grid to make sure I hadn't stolen it from them? As for once you know... personally I'd be tempted to edit with a brief "I now know this was stolen" but I can see the problems a fashion blogger would have if they had to delete old posts. I feel for the bloggers who have worn stolen skins in numerous posts, particularly for reviews of items that are in no way related to that stolen item. Should these bloggers have to delete every post that shows the offending item? NO. But an edit to remove the link to the store may be in order, along with a comment pointing out that it has since been discovered that the item was stolen. The only person who can be held at fault is the person who stole the item, and took advantage of trusting bloggers and customers. The bloggers have become a very huge part of the fashion industry in SL. Most of my fashion finds now come from the blogs. I don't think it's reasonable to expect bloggers to investigate every item they review. It's a very complex issue that will take designers and bloggers working together. Maybe starting a forum or in-world group for established bloggers and designers to discuss these issues amongst themselves. As a consumer that wants to support real designers I don't want to do business with theives so letting the bloggers know would help us out. Ketsy and I had a delightful conversation last night and an idea popped up: what if someone made a google document with all these sensitive info? I think - rather I know that the reason creators choose to keep their DMCA processes quiet is that they are trying to sort it out without causing too much drama. After so many complaints and designers saying that their items have been stolen people tend to look at them as "whiners" which really isn't what they were after. Also - part of the DMCA process is gathering information and making sure that the item(s) in question are copied. If a designers starts a ruckus and the offender takes it down - there is no reason to keep it down. They can just wait a few months and do it again. I don't know how many times designers have been banned from a thief's store because they started to notify the world about the theft - so vocalizing the theft or problem just seems to create more problems. Some bloggers are trustworthy - I trust you and a few others but how many really have altruistic intentions? I have seen bloggers hang others out to dry and other bloggers support the thief after the evidence has been turned in, so as a creator it becomes difficult to discern who has got your back or whether they have other ideas in mind. Maybe DMCA notices should be publicized once they have been verified? That might be one way of getting the word out. 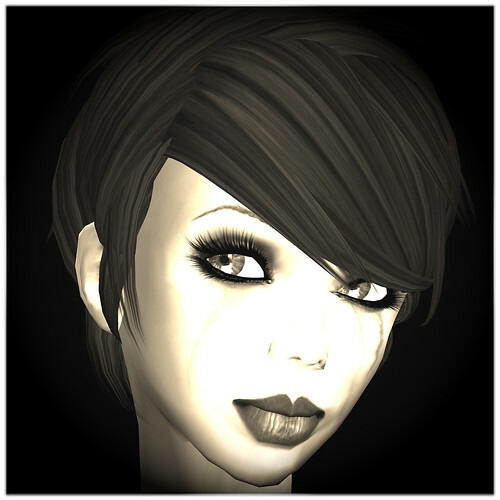 As far as bloggers, creators and consumers are concerned SecondLife seems to have a seedy underbelly of crime and theft which so far hasn't improved one bit since I've been involved in SL. So what can we do? As bloggers - just post what you think is legitimate, there is no real way of telling if something is a rip or a valid creation until the process is revealed and that won't happen because creators are a little sticky about their files. I suggested this to a friend of mine but we both were kind of dismayed at the amount of responsibility it would entail: A designers guild? No really. The only problem is who would run it and how would the guild membership be ascertained? Also - would this be a fee based membership and how many would want to join? Lots of questions - very few answers. I don't think anyone honestly expects a blogger to be informed about every single DCMA claim out there and every case of theft. That's crazy talk. Like it was said here by a few people, the most we can do is make an edit after the fact stating we were unaware of the stolen content and delete the SLurl. If I look back at a Ketsy outfit from 5 months ago and see a stolen skin, I wouldn't bat an eyelash. Ya know why? Because you are an honest person who we ALL know does not support content theft. And that goes for all respectable bloggers who keep out of the drama-soaked cesspool of ickiness and just want to blog for fun and enjoyment. Don't lose sleep over it, its an ugly part of SL that isn't going away anytime soon. The best we can do is try to stay informed about the public cases and MAKE SURE that its an open-and-shut case before any public statements. No need to feed into the drama further, channo? <3 ya mama!